Looking forward to installing chic, modern bifold doors into your home, but feel unsure how to style them? Many people wonder how to dress bifold doors because it can be quite an adjustment to have such a large expanse of glass to cover. On the one hand, installing window furnishings for bifold doors can detract away from the stunning focal point that bifold doors offer. One of the huge benefits of aluminium bifold doors is that they have slim frames and create the appearance of a huge glass wall. Bulky bifold door curtain, blind, or shutter installations might detract from this contemporary look. On the other hand, homeowners have bifold door privacy to consider. If a home is overlooked by neighbouring houses, it’s natural that you might want to install blinds, curtains, or other furnishings in your door to keep out prying eyes. Every homeowner is different when it comes to deciding how to dress bifold doors and ultimately your choice of window furnishings will depend on your personal tastes and your budget. Let’s take a look at various window dressing solutions to help inspire you. Blinds are a brilliant and very popular method for dressing bifold doors because their contemporary look really complements the modern style of the doors. Panel blinds for bifold doors are popular because they work well for floor-to-ceiling windows. They run on a track installed just in front of the door, a little like curtains, and each panel is able to overlap one another so that only the width of a single panel covers the door when fully open. Usually, roller blinds are installed within the frame of each individual leaf of the bifold door so that the door can slide and fold open as normal. 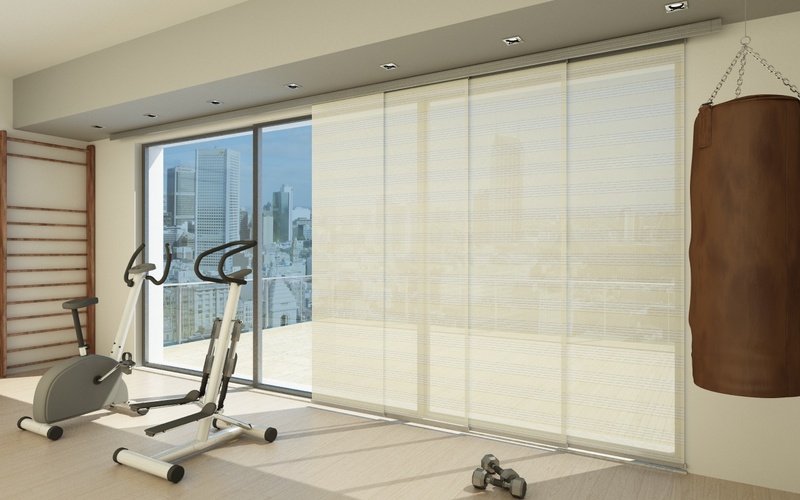 However, the cords or pulleys of roller blinds might disrupt the sleek, minimal appearance of the doors. 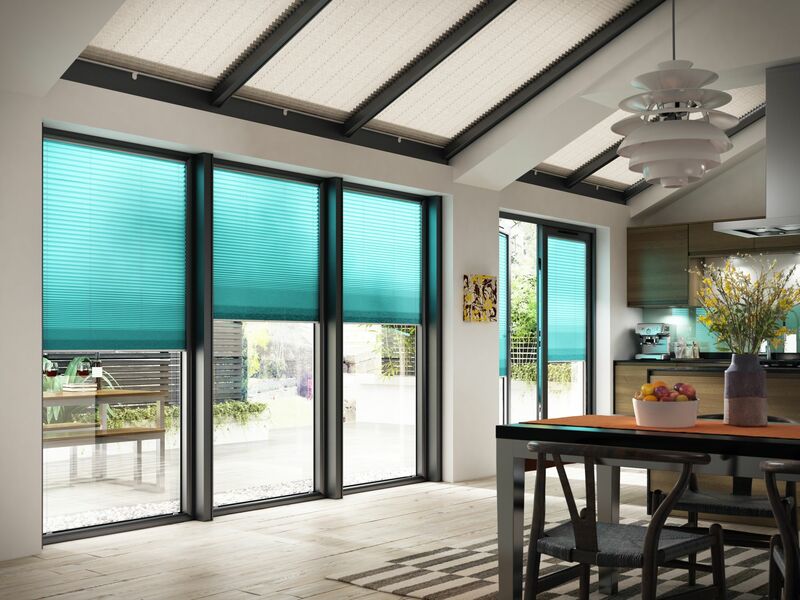 Like roller blinds, these are fitted within the frame of each leaf of the bifold door. The benefit is that they offer flexible light filtration so that you can maintain privacy while allowing some natural light to enter the room. You’ll probably be able to find all of the blinds above with electric control functionality, which basically mean they operate with a motor and a remote control. Electric blinds for bifold doors are a great choice for very large apertures because they allow for much easier and faster opening and closing of the blinds. These are installed inside each glazed panel of the bifold door and are controlled electronically. They offer a very clean, minimal, and modern look and are very easy to operate. However, they tend to be more expensive than other types of blinds. We can’t necessarily recommend the best blinds for bifold doors because it depends on many factors, an important one being budget. When it comes to price of blinds for bifold doors, the simpler the blind is, the more affordable it will be. Electric and integral blinds tend to be more expensive, but the investment might be worthwhile if you value the convenience of remote-control operated blinds. Blinds which are operated manually by cords or pulley systems tend to be much more affordable. However, if you have a large bifold door with many leaves, it can be time consuming to open them. Consider how often you’re likely to be opening or closing the blinds; if it’s likely to be daily, ease of operation should be an important factor to consider. Shutters for bifold doors are usually installed across the full width of the entire aperture, just inside of the bifold doors themselves rather than within the frame of each door leaf. They could also be installed outside of the house instead if you’d prefer. They usually fold and slide in a concertina effect, but separately to the bifold doors themselves. The benefit of shutters is that they offer greater control over the amount of light you let into the room compared to curtains or blinds. For example, if the sun is shining brightly and directly into a room and causing glare, you can adjust the position of the shutters to alleviate the glare without completely shutting out the daylight. Shutters have a somewhat traditional look to them, and this is what draws many people to them. However, sometimes this classic look is at odds with the contemporary appearance of bifold doors, particularly aluminium bifold doors. Nonetheless, if you opt for a wood-effect powder coating on your bifold doors, such as the finishes which are offered here at Shire Doors, it could be possible to achieve a traditional look which complements that of the shutters. 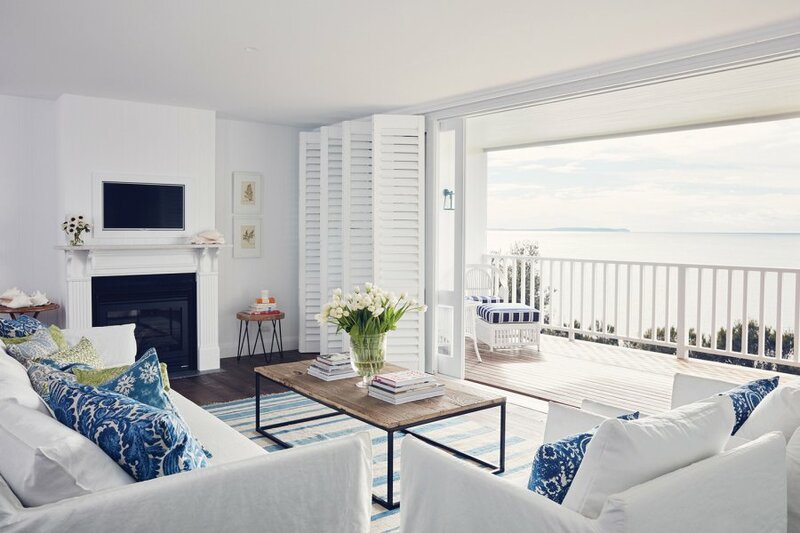 It’s also important consider the ease of use of shutters for bifold doors; if you want them fully open, you have to fold and slide them open which can be time consuming if done on a daily basis. You must also consider that when they are folded open, they’ll encroach on a small amount of indoor space. Curtains tend to be the most popular option for dressing windows in residential properties and they can be an excellent option for bifold doors. The rail or curtain track for bifold doors is usually positioned on the wall above the door aperture so that the curtains are less likely to catch on the door when it is opened. Compared to blinds or shutters, curtains can create a softer, cosier ambience which may be favourable for living rooms or spaces in which you will be relaxing in. They also provide a great deal of variety in regard to fabric, colour, design. If you’re wondering how to dress bifold doors to coordinate with the rest of a room’s décor, curtains might be an excellent option because you can try to match them with other soft furnishings. One of the downsides of curtains is that they don’t offer all that much flexibility in terms of light filtering compared to shutters or Venetian blinds. However, one way around this is to opt for a light fabric, such as voile or muslin, which help to dim natural light without completely blocking it out. Just bear in mind that these types of fabrics won’t offer you quite as much privacy as heavier fabrics, particularly at night when indoor light will illuminate a room to those looking in from outside. Another factor to consider with curtains is the size of your bifold doors and whether you’ll be able to find a curtain pole strong enough to hold them. Curtains can be extremely heavy, particularly if they’re blackout curtains or made from a very thick material. This is even more important if you’re working with very wide bifold doors. Finding a suitable curtain pole for bifold doors which are extremely large may prove difficult, so if this is the case with your doors you may be restricted to sheer voile curtains, or to alternative methods for dressing your windows. If you don’t like the idea of dressing your bifold doors with curtains, shutters, or blinds because you love their modern, minimalist look, you could consider switchable privacy glass, also known as smart glass, instead. Switchable glass bifold doors use an electrical current which allows the glazed panels to switch between being opaque and transparent. When the electric privacy glass is turned off, you can enjoy complete privacy from the outside world. When it is turned on, the glass becomes transparent, just like normal glazing. However, sometimes privacy glass can have a milky, slightly opaque appearance when turned on; the clarity is not quite as good as with standard glass. Privacy glass sliding door and bifold doors are an excellent choice for interior doors which provide flexible living or work spaces. They can allow a room to become totally private in a matter of seconds, which is particularly useful for offices or meetings rooms. The big downside of smart glass is cost; it tends to be a far more expensive option than curtains or blinds for bifold doors privacy. It’s tough to estimate the average switchable glass cost in the UK, but prices can be as much as a thousand pounds or more per square metre.